Description: Created with Brass and Glass. 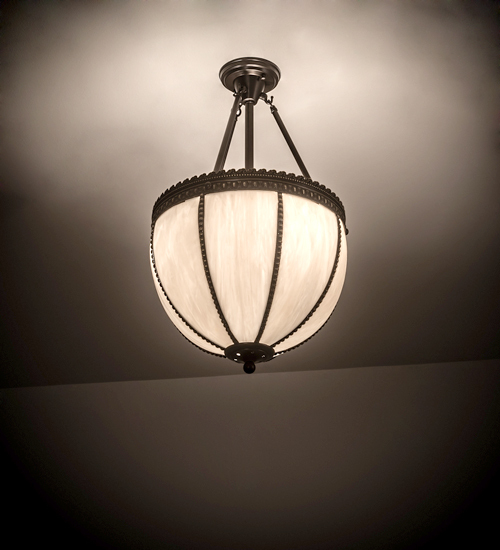 Shansky is an elegant ceiling fixture featuring beaded filigree with a miniature button and bow design accenting the decorative trim. Matching filigree creates a classic design on this White art glass diffuser which is created using Meyda Tiffany's famous copperfoil construction and accented with a matching finial. The Brass decorative accents, frame and hardware are featured in a Craftsman Brown finish. Custom crafted in our 180,000 square foot manufacturing facility in Upstate New York in Yorkville, NY. Offered in custom sizes, styles, and colors. Dimmable energy efficient lamping available. UL and cUL listed for damp and dry locations.